Spend a minimum of RM30 in a single or combination of 2 receipts with your AEON Member/J Card or Sign up/renew as an AEON Member to receive an entry form. Submit your contest form in the entry box before the closing date. 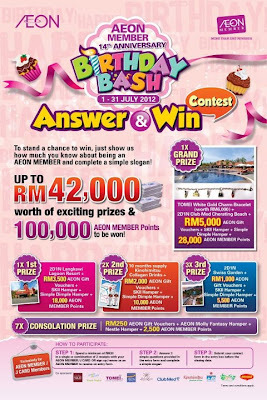 Visit AEON Facebook fan page for more details. Party people... Your chance to party with Ferry Corsten Live in KL this July!